Lemongrass Hydrosol; Antimicrobial, anti-inflammatory & antiseptic properties help control and sooth scalp disorders & inflammation. Lemongrass extract can help strengthen hair follicles. Soy Protein; Strengthens and mends hair. Increases the ability for hair to maintain proper moisture levels. Smooths & adds shine. Aloe Vera extract; Contains enzymes that help repair dead skin cells on the scalp. Helps relive itchiness and dandruff effects. Very soothing leaving hair and scalp feeling conditioned and healthy. Cocoa Butter; Has healing and softening properties that help make your hair healthy, detangled, smooth & shiny. Jojoba Oil; Adds moisture, detangles, smooths & adds shine. Rosemary Oil; Helps nourish and stimulate blood flow to hair follicles, helping create the perfect environment for growing stronger, healthy hair. Smooths, adds shine and detangles. Orange Oil; Contains high levels of vitamin C that help protect & heal scalp/skin & hair. 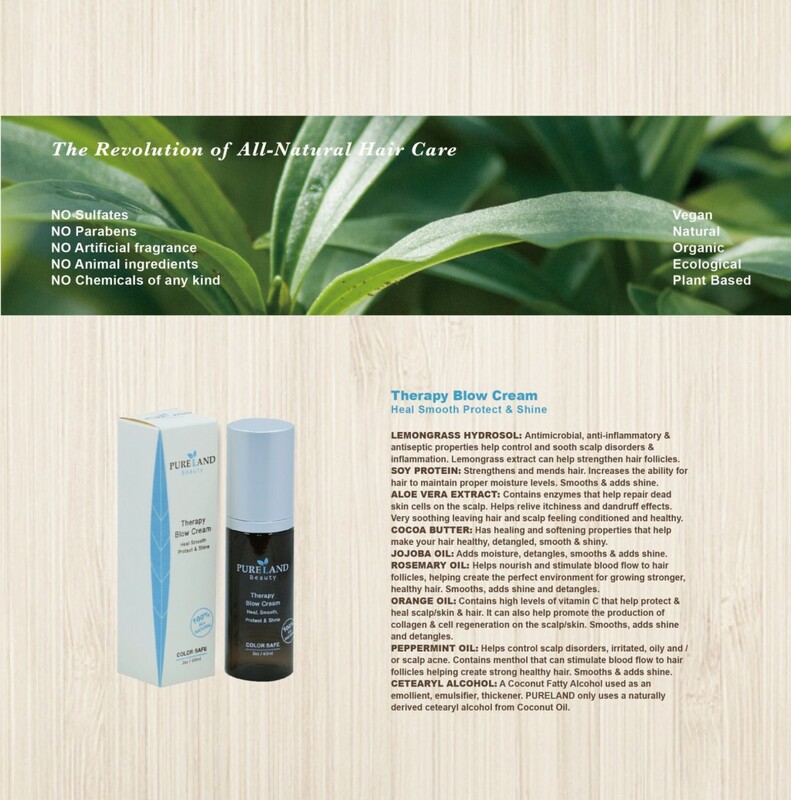 It can also help promote the production of collagen & cell regeneration on the scalp/skin. Smooths, adds shine and detangles. Peppermint Oil Helps control scalp disorders, irritated, oily and / or scalp acne. Contains menthol that can stimulate blood flow to hair follicles helping create strong healthy hair. Smooths & adds shine. Cetearyl Alcohol: A Coconut Fatty Alcohol used as an emollient, emulsifier, thickener. 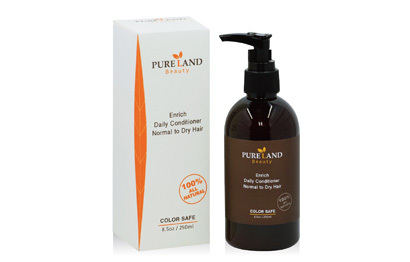 PURELAND only uses a naturally derived cetearyl alcohol from Coconut Oil. 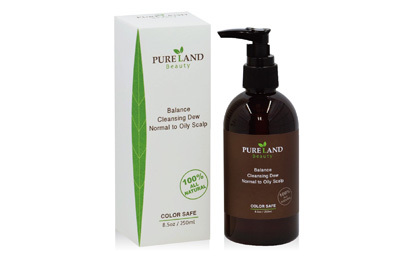 PLEASE NOTE: Because PURELAND products use 100% natural plant based ingredients the natural fragrance will slightly change depending on what season the botanicals are harvested. contents must be finished with-in 6 months after opening. Ingredients: Lemongrass Hydrosol, Soy Protein, Aloe Vera extract, Cocoa Butter, Jojoba Oil, Rosemary Oil, Orange Oil, Peppermint Oil, Cetearyl Alcohol. Directions: On damp or dry hair, apply Therapy Blow Cream (dime size to a quarter size, depending on hair texture and length) distribute evenly from mid shaft to ends then toward the scalp. Leave-in and heat style or let air dry for natural controlled texture. Great on all hair types, even fine/thin hair.